In this blog post I’ll describe how to add external USB hard drive to Hyper-V virtual machine. In my case I have an external WD USB hard drive with 500GB capacity and I want add that drive into my Hyper-V virtual machine. NOTE: As you probably know, removable usb drives is not supported in Hyper-V.
1. On your Hyper-V host open Disk Management. 2. Choose external USB hard drive and right click on him. 4. 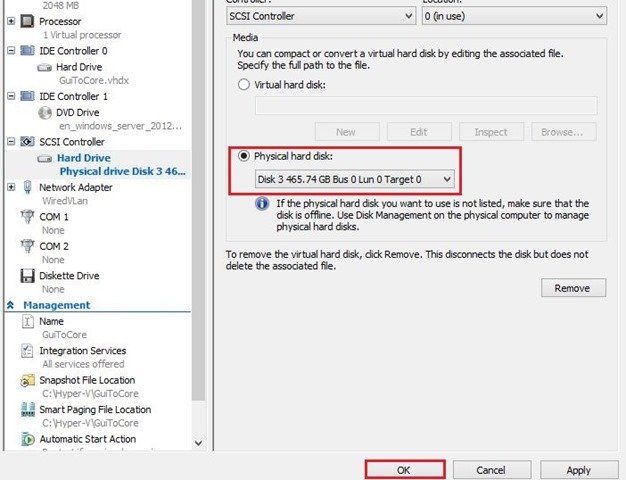 Open Settings on virtual machine to which you want to add external USB drive and select SCSI Controller on the left hand side, select Hard Drive, and click Add on the right hand side. 5. Check mark Physical hard disk: , select external USB hard drive na click OK.
6. 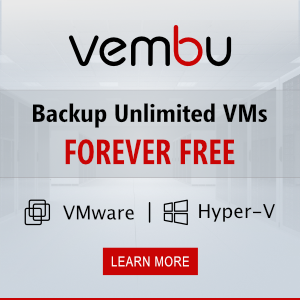 Logon into VM and open Disk Management. Click on newly attached Disk and bring him Online. E bas mi je drago ;) Hvala na komentaru! Normally it detects it self but in V machine there is a bit difficulty. Jako koristan post. Keep on with a good work :-). I have a problem regarding this issue. I usually attach my external hard drives the same way u mentioned, but the problem is when the server shutdowns accidentally(electricity failure) “it happened with me today”. 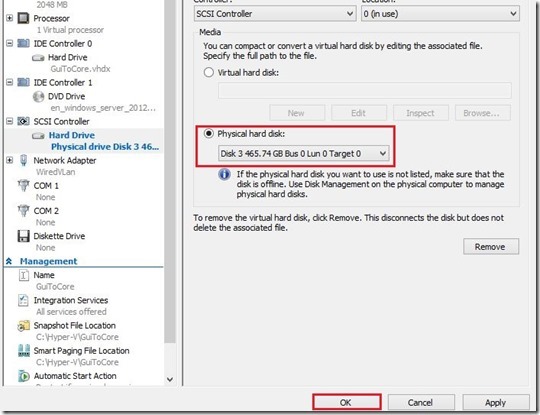 Now the server in the Hyper-V manager is showing (off) and when i try to turn it on, it is not working and giving an error (synthetic SCSI controller ) so what shall i do , how can I safely remove the harddrive when it is off. Hi.. am facing a problem that after following above process upto 5th step i am not able to find attached disk in the virtual machine. i am using windows server 2008 r2 standard. how to resolve the problem. Did you followed step 1-4 as I described (put disk offline, add new hdd as scsi controller)? I have been do that many times with different external USB HDD and I didn’t had any issues. As I mentioned in post, you can’t add removable usb drives! I’m trying to attach an usb hard drive to a VM. I have a standalone hyper-V 2012 server installation with no GUI. I’ve used diskpart to take my external device offline but I can not see it on the dropdown list of physical drives. Do you know any solution for this? I had similar issue with one of my usb hdd and I convert WS2012 Core to GUI. After that I could see usb hdd on the dropdown list. When I back to Core usb hdd was on the dropdown list of physical drives. Try to do that maybe will help. Romeo, Thanks for clear & easy to understand process for popular admin problem. On Hyper-V 2012 Core what PowerShell command would take the drive Off-Line? Dismount-DiskImage or Disconnect-VirtualDisk seem to be for different function. and then run list disk and your select disk drive should show as offline. you can now add the disk to the VM in hyperV manager. The problem is, as you said in your 4TB hard drive on XP. Install Windows 8.1 or WS2012 R2 and create VM Gen2 which recognize external disks, usb etc. Thanks Romeo, simple and good post.. Please install Hyper-V role on the Server 2012 / R2 or Windows 8… You have been using old technology :( . Also, can’t do that with IDE disk! Nice doc and it’s help lot. Amazing! This trick still works! I guess this is to protect multiple operating systems writing to the same device at the same time leading to locking. I can’t make the USB offline! 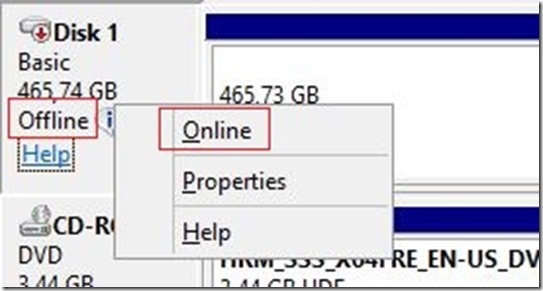 it appears that making a disk online/offline is not supported on removable media! what can I do ??! Most excellent post, thanks for sharing!! Very helpful and the instructions are excellent. Thanks. is this works in VM windows2000 OS?